Eddie Lang, the “Father of Jazz Guitar,” was born in South Philadelphia. Lang was inducted into the Philadelphia Walk of Fame in 1992. On Sunday, October 23, Eddie Lang Day, the Mural Arts Program will dedicate a mural in honor of the jazz legend. The dedication ceremony will be held at 7th and Fitzwater Streets. For more info, go here. 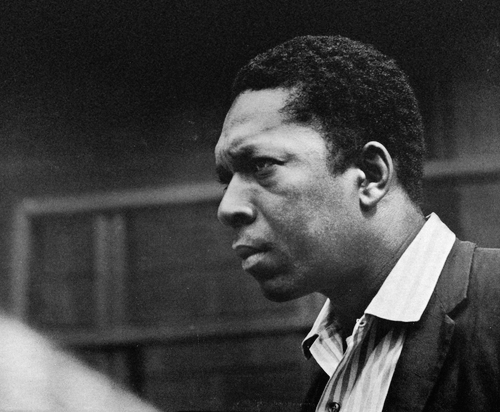 Jazz legend John Coltrane personified cool. Coltrane was into cultural heritage preservation before it was cool. His composition, “Alabama” was in response to the Sept. 15, 1963, bombing of the 16th Street Baptist Church that killed four young girls. His mournful tribute captured the zeitgeist of the Civil Rights Movement. When we heard – John and I – when we first heard Charlie Parker and Dizzy Gillespie – I told you he was sounding like Johnny Hodges – our lives changed that night. We had never heard any music like that. Never. We were screaming like these Beatles groupies, when they used to hear the Beatles. Coltrane kicked his heroin habit at his home in Strawberry Mansion, a neighborhood in North Central Philly. 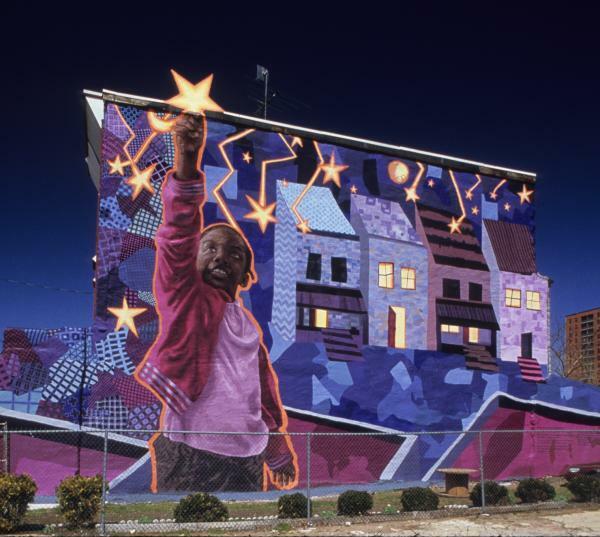 The Mural Arts Program, in collaboration with the community, honored a former neighbor. 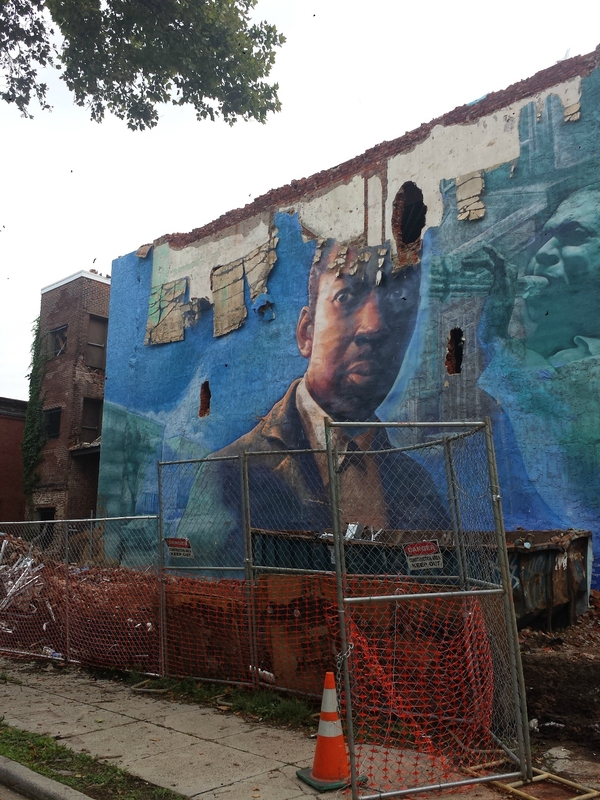 On or about Sept. 15, 2014, Pennrose Company demolished the Tribute to John Coltrane mural. I know they lied because I was part of the only discussion that has taken place. At the March 10, 2015, meeting with Mural Arts, Lopa Kolluri, Pennrose’s Vice President of Operations, asked for a “menu of options.” Mural Arts sent a proposal and several follow-up emails to which Pennrose has yet to respond. Pennrose’s arrogance is particularly galling given the company has feasted on public subsidies seasoned with political donations for nearly 40 years. In 1989, a Philadelphia Inquirer story noted the company’s reliance on government subsidies. They say that “blues ain’t nothing but a botheration on your mind.” It’s bothersome that developers are erasing African Americans’ cultural heritage. In Philadelphia, developers routinely – and without notice – demolish or cover up murals that are paid for in part by City taxpayers. Murals are part of Philadelphia’s cultural landscape. The Mural Arts Program creates murals that engage the community. They reflect a community’s history, identity, hopes and dreams. 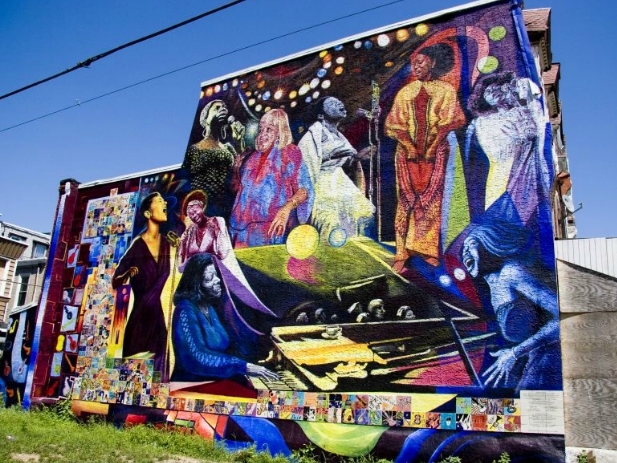 City Council members can use Councilmanic Prerogative to require that developers of publicly-subsidized projects replace murals of social or cultural significance. Who will determine which mural meets that threshold? Let’s stipulate that murals that tell stories about events or persons who are the subject of books, songs, documentaries, national holiday, or City and congressional resolutions are culturally significant. The how of replacement is negotiable. What is non-negotiable is that developers can erase African Americans’ cultural heritage because, to borrow a phrase from Al Gore, there is “no controlling legal authority.” A district Council member is the controlling legal authority in his or her district. He or she decides which projects go forward and which ones go nowhere. While developers view murals as disposable, district Council members must exercise their prerogative and demand that they respect that which came before.